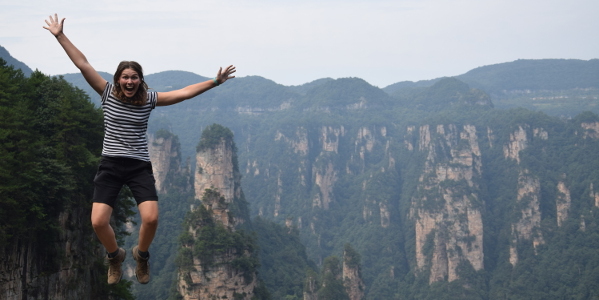 It was day three in Zhangjiajie national park when our moods changed from calm and impressed to truly delighted. The sun came out and the panoramas that we had admired for two days that had been cool but flat like a 2D photograph suddenly turned into an epic 3D panorama. The world looked so different in the sunshine, the mountains were taller, more creased and crinkled like scrunched up paper towers covered in lush green trees. 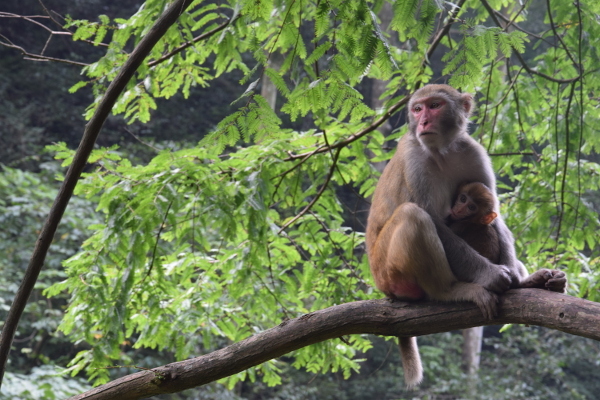 We darted past monkeys, which on grey days had taken up hours of our time, along the golden whip stream towards the most famous sights of the park. 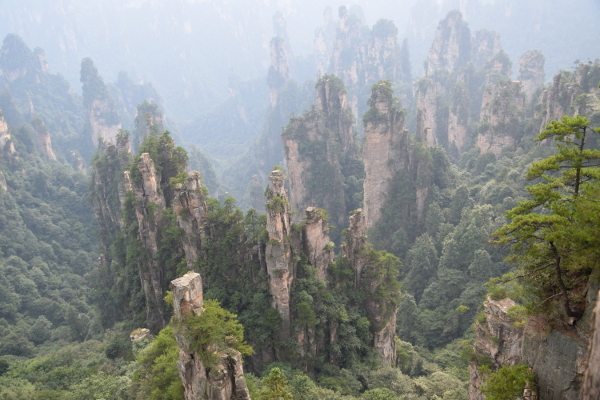 These mountains are fondly called ‘the Avatar Mountains’, and the main pillar rises up out of the canyon like the iconic Hallelujah mountain from the film. The hike up through the jungle saved us the pressing tour groups which got the elevator, and offered us access to platforms with views probably more stunning than those that were over-visited. A shuttle bus later and we reached another walking path on the ‘Emperor’s Peak’. 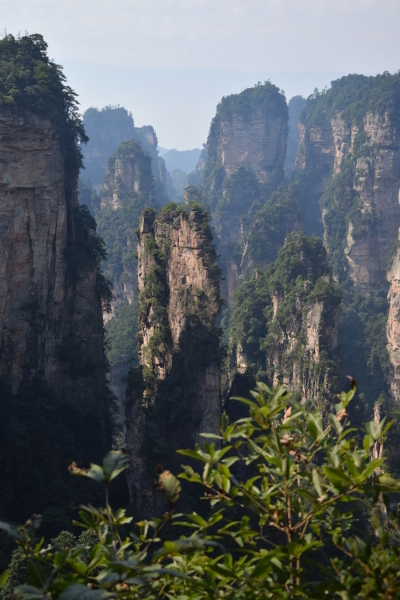 Although we were slightly put off by the fact that this path was a ‘there-and-back’ walk, it was by far the most serene, offering the same views as Tiamen Mountain but with a fraction of the people and a further view. It was far more wild than the rest of the well-trodden park, with steps crumbling, moss taking over footpaths, and even some areas without the barriers protecting the masses from the cliff side. Here we also found a jungle track which mysteriously disappeared into the undergrowth, and was not on our map. The map- oh how we lamented about the map. It seemed that at every national park the ‘tourist maps’ deemed acceptable are so far from what we expect. No scales, no height measurements, missing routes, routes marked that don’t exist… our complaints went on. 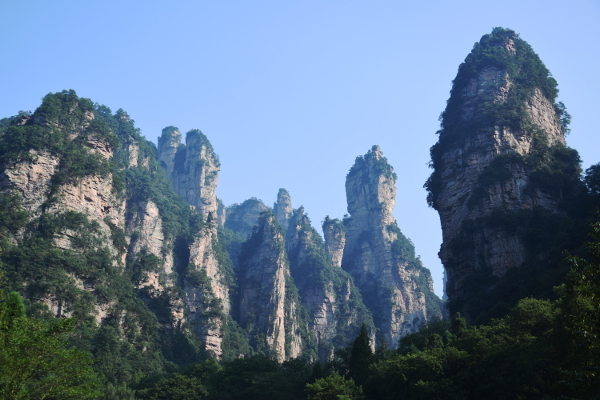 Zhangjiaje was particularly disorienting, though, as the park does not use consistent maps across the park. They don’t even angle all of the maps north. Some maps cover the whole park, others just a small section. All in all it was terribly confusing. (In fact, the best map I have found was post visiting and is located here). It was not the maps fault, though, that we ended up nearly missing our bus that evening. Following our small diversion into the jungle we visited Tiamen Mountain and enjoyed some great views as the sun started going down and the tour groups disappeared. Unfortunately, we still had the long walk down the mountain ahead of us and we found that we had to get a move on to make it. At the bottom of the mountain the shuttlebuses that were meant to take us to the entrance were all full. Eventually we found one to squish into, which was soon the most terrifying bus ride in China. Standing in the isle, clinging on to the bars, we were virtually thrown from side to side as the bus driver expertly swung around corners at impressive speeds. The last rays of sun disappeared as we joined the crowd of people pushing though the barriers and walking past large ‘Avatar’ statues, souvenir stalls and a whole host of restaurants which displayed all of their ingredients (including pigs heads) outside. We’d had three good days- one wandering the southernmost peaks of the park (Yellow Stone Village), one attempting to scale Tiamen Mountain against the flow of tourists (endless steps!!) and finally, and this glorious sunny day. DIY advice: should you be heading to the park, resist all temptation to ‘do as the locals do’ and carry your food in a plastic carrier bag. The monkeys know your weaknesses and we saw more than one person’s snacks and lunch being devoured because they had not stored them securely. You have been warned.